As a fan of technology, I am not tied to any particular OS. I use Windows XP on my work laptop, Ubuntu Linux 10.04 on my work desktop, run Windows 7 on my home desktop and Mac OS X on my 21.5” Apple iMac. I like to try the best of breed apps in all OS and share it here in the blog. 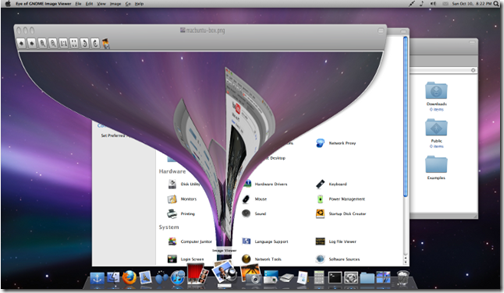 After using my iMac though, I have started to take a liking for some of the nice features in Mac OS X. Especially the ability to switch windows, being able to use Expose – where you move your mouse to a desktop corner to see thumbnails of open windows, etc. Now, I can get the same features on my Ubuntu Linux easily with the Macbuntu theme. It is a well-made theme and very easy to install too. It installs all the necessary icons, docks and visuals to make you think you are working on a Mac without having to pay for one. Enter your root password and answer the questions. At the end you’’ll also get get to pick a theme for Firefox and Chrome. Restart your system when it asks you to. That’s it. Enjoy the Mac OS X look on your Ubuntu Linux. It even has the nice Apple logo on the bootup screen (if you chose to install that). Isn’t it? I totally love it too. But, I am still on 10.04 and probably will upgrade it when we come back from our vacation.